Resorts World Manila will see a new hotel opened by Japan’s Hotel Okura Co Ltd sometime in 2018. Travellers International Hotel Group, Inc. has entered into a deal with the Tokyo-based firm that will see their first hotel open in the Philippines. The property is expected to focus on business travelers who will conduct their affairs in Makati City, the “Wall Street” of Manila. The Resorts World development is strategically located near the Ninoy Aquino International Airport. The state-of-the-art resort destination will, of course, also attract high rolling Japanese visitors accustomed to Okura’s Japanese-style hospitality of simple sophistication. The 11-story hotel will offer 60 sqm (646 sq ft) rooms along with fitness facilities and a pool. Japanese and Spanish cuisine will be featured at the property’s restaurants along with all day dining and a lounge. Hotel Okura’s president, Toshihiro Ogita said: “As Hotel Okura’s first hotel to open in the Philippines, we will leverage the group’s expertise in traditional Japanese hospitality to make Hotel Okura Manila a much-beloved hotel among both local and foreign visitors,” according to a press release from the company. Tourism in the city has been growing steadily in recent years with an expected 12 million visits by foreigners annually within five years. Ogita said he expects ” mid to long-term growth” to continue through 2022. 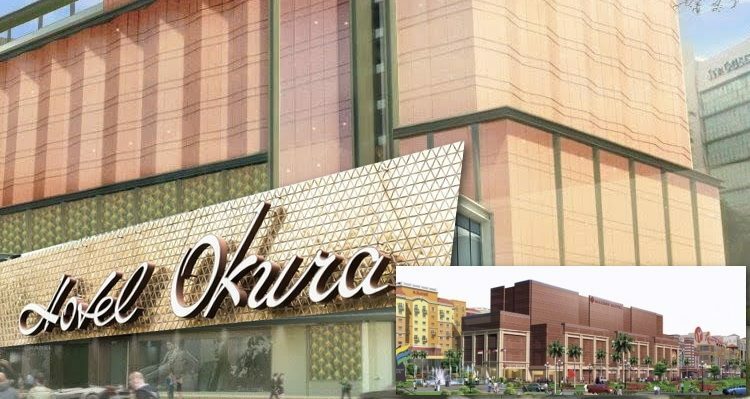 According to a report in GGRAsia, Travellers International earlier announced that Hotel Okura would operate an Okura hotel in their Westside City Resorts World development, formerly known as Bayshore. That massive project is on the edge of Entertainment City and is expected to open in 2020. Hotel Okura Co currently operates 72 properties including Hotel Okura Macau at Galaxy Macau. Forty-seven of the company’s properties are located in Japan with the balance offshore. They plan to add at least 28 more properties to their portfolio. Eleven of those are slated to open in the next three years under Okura Hotels & Resorts, Nikko Hotels International, and the Hotel JAL City brands. Resorts World Manila had welcomed Okura Manila in 2014, however, this property is in a slightly different location and is not the property mentioned (inset, pictured) in previous news reports, according to a side note from Travellers.